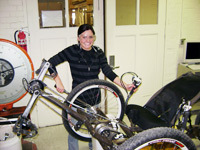 Alicia Martin, a UW master's student majoring in mechanical engineering and a member of the Science Posse, is a workshop presenter at the 13th annual Women in Science Conference at UW May 8. Martin is pictured here with a moon buggy, which she helped design as a part of a team that competed in the NASA Great Moonbuggy Race at Marshall Space Flight Center in Huntsville, Ala., last year. About 400 junior high and high school girls from across the state will descend on the University of Wyoming Tuesday, May 8. They won't be cheerleaders waving pom poms, but rather budding scientists shaking lab beakers and potential future engineers solving math equations. The 13th annual Women in Science Conference, which will take place at various UW locations from 8:30 a.m.-3:15 p.m., is designed to raise female students' interest and excitement in science, technology, math and engineering (STEM) -- career fields typically dominated by men. Michele Turner, program coordinator for the Wyoming NASA Space Grant Consortium, the group that organizes the conference, is well aware that many girls start out with an interest and acumen for science -- one that often disappears by the time they reach the high school level. Turner says she is not sure whether there is a problem of female students being discouraged from pursuing STEM fields, but surmises a lack of role models and/or interesting experiences in science may be part of the reason. "I think we need to show young women all of the possibilities that are out there in the interesting experiences of science," Turner says. "They can study polar bears in Alaska, the disappearance of honey bees, the distribution of frogs, the evolution of galaxies, how to design the next electric car. The possibilities are endless." "We need to provide engaging experiences to highlight these possibilities and provide role models in these fields, so they can see someone who looks like them doing these things," Turner continues. "This is what makes the difference, and this is why Women in Science conferences are so important." 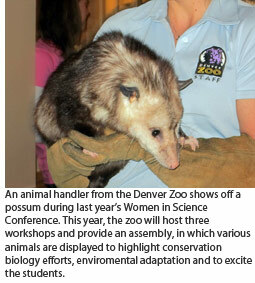 The conference will include a variety of hands-on workshops, tours of UW labs and research facilities, opportunities to meet professionals who "conduct science" on a daily basis in their careers; and even a live-animal assembly, courtesy of the Denver Zoo. In addition to UW faculty and students, workshop presenters will include those from the National Weather Service, the University of Wisconsin, U.S. Geological Survey, National Oceanic and Atmospheric Administration, the Denver Zoo, Cheyenne Botanic Gardens, and local business and industry. Ron Whitman, who teaches a seventh-grade life science class and an eighth-grade physical science course at Laramie Junior High School, has taken his students to the conference in past years and expects about 25 of his students to attend this year's conference. Whitman says the conference is valuable because students learn "different occupations that could be available to them that they didn't know about. They learn different career choices. That's the big thing." "Hopefully, it will encourage more women to think about careers in science, engineering and math, and encourage them to pursue degrees in this area," Turner says. "This will open up higher-paying job opportunities for women and create a well-educated population of women." In addition to Laramie Junior High School and the UW Lab School, students from the following communities will attend: Casper (Centennial Junior High and Dean Morgan Junior High), Cheyenne (Cheyenne East, Cheyenne South, Johnson Junior High and Noah Webster Christian School), Douglas (Douglas middle and high schools), Glendo (Glendo School), Glenrock (Glenrock Middle School), Green River (Green River High School), Lander (Lander Middle School), Lusk (Niobrara County High School), Pinedale (Pinedale Middle School), Rawlins (Rawlins Middle School), Shoshoni (Shoshoni High School), Wheatland (Wheatland High School) and Yoder (Southeast High School). For more information and a schedule, go to http://wyomingspacegrant.uwyo.edu/ or contact Turner at (307) 766-2862 or mturner@uwyo.edu.